It began at Vicarage Road when United conceded late to Juan Zúñiga and Troy Deeney in a loss to Watford. Then Joe Allen leveled for Stoke at Old Trafford. Olivier Giroud’s header and now Marouane Fellaini’s foolish challenge, leading to Leighton Baines’ converted penalty, bring the running total to seven points dropped in the final ten minutes of Premier League matches for United this season, the most by any club. If league matches were eighty minutes long, United would still be outside the Champions League places but within one result of Arsenal, Liverpool, City, and two of Chelsea. While their poor finishing would remain an issue, they’d also be the top flight’s third best defense behind only the Blues and Spurs. José Mourinho has claimed his side are the league’s least fortunate. Certainly, injuries have left him with a constantly shifting back four. Center backs especially need to play together consistently to develop a positional understanding. On the other hand, it can be argued the match at Goodison Park saw Lady Luck smiling down on the Red Devils. Marcus Rojo should have been sent off early for leaping two-footed into a challenge. Instead, Michael Oliver only cautioned the Argentine. Yes, Oliver also let Gareth Barry get away with a rash challenge and a deliberate handball that could have made the contest a ten v ten affair in the first quarter-hour, and neither he nor the linesmen were in position to decide whether the tumble in which Zlatan Ibrahimović’s heel found Seamus Coleman’s temple was anything more than incidental. The latter didn’t appear so, even on replays. Coleman, with open grass before him, inexplicably put on the brakes leaving Ibra nowhere to go but through him. The Swede seemed to be trying to avoid injuring the Irishman as he rolled over him, concern instantly showing on his face, followed by an apology, when contact was made. Intent doesn’t always enter the equation, though. The point is, Mourinho, who never left his seat for the match, thereby freeing the officials from any distractions, can only blame his choice of substitute for United failing to see yet another match through. 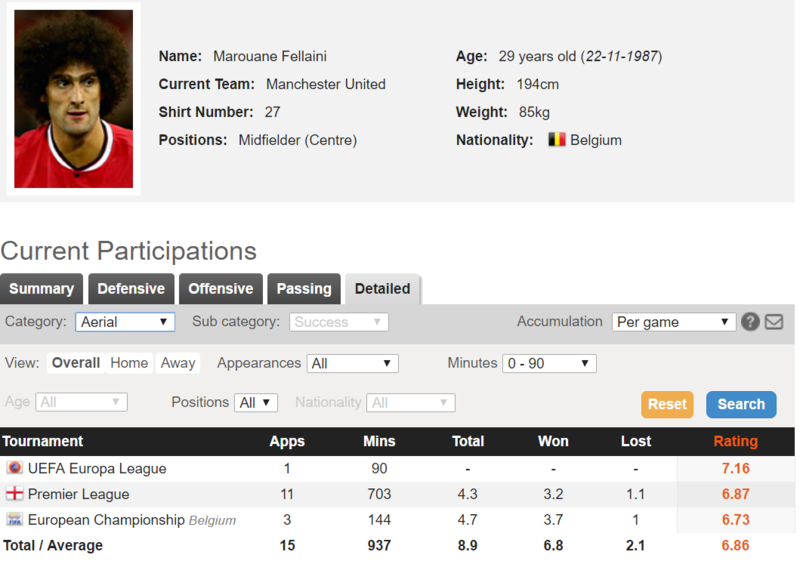 When he does not start matches, Fellaini is usually brought on for his aerial abilities. There are questions Mourinho should be asking himself with regard to the Belgian, however. 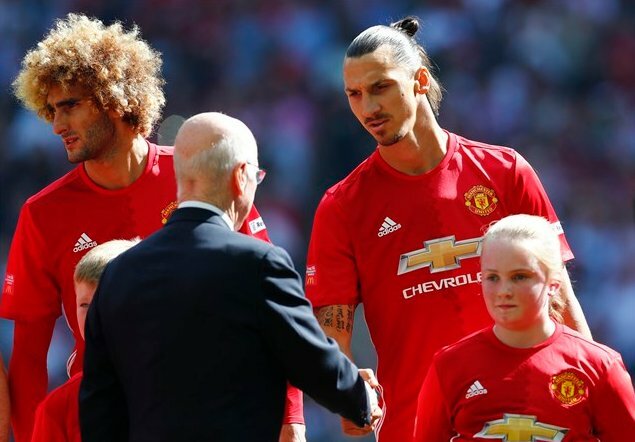 First, he’s listed at 6′ 4″ but always seems more than an inch shorter when pictured next to Zlatan. Mourinho ought to be wondering whether physios are counting his prodigious afro in their measurements? Thankfully, there is this photo, which suggests they have it right. He apparently just runs about in a slouch. 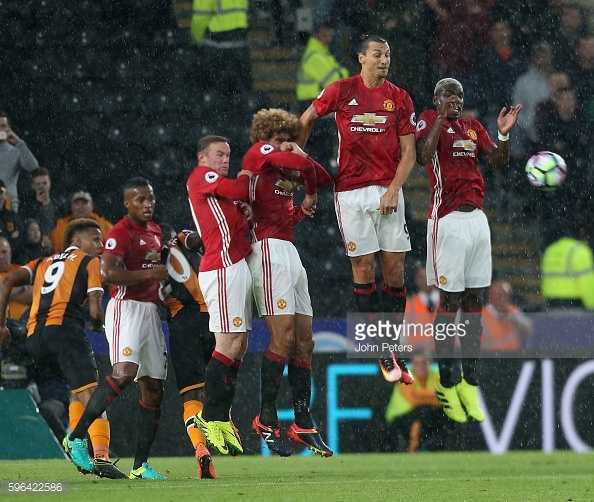 On the other hand, there’s this image, suggesting Fellaini may be tall, but doesn’t have an impressive vertical leap, not to mention a mistaken belief he has a face someone other than a mother could love. So, if his leaping ability isn’t the best, is putting Fellaini in to protect against late crosses very effective? 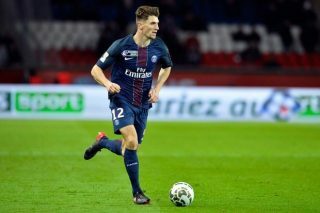 WhoScored?.com says it is, revealing his height wins him better than three of four aerial duels on average. 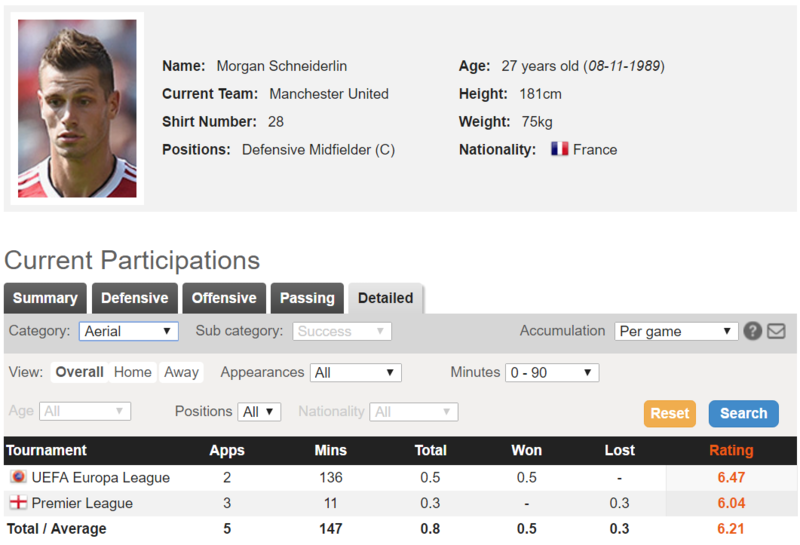 The alternative when another defensive midfielder is required would be Morgan Schneiderlin. Unfortunately he has a virtually non-existent aerial presence, winning roughly two of three contested battles but entering less than one per match. Eric Bailly, recovering from a knee injury, was on the substitute’s bench. Given Mourinho placed him there, it’s reasonable to believe the Portuguese could have used him for the remaining ten or eleven minutes, stoppage time included. 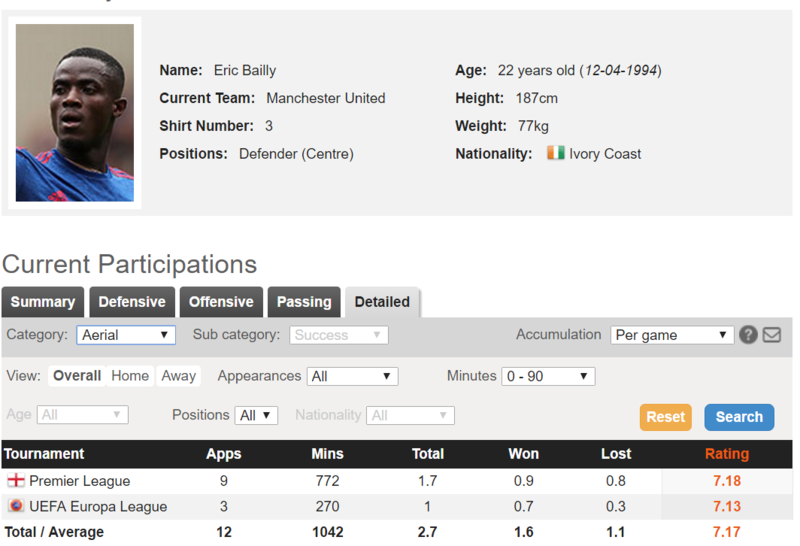 Bailly’s aerial success rate is similar to Schneiderlin’s but he averages more than three battles per match. Most importantly, with allowances for hindsight being twenty-twenty, the two Frenchmen are far superior to the Belgian on the ground. 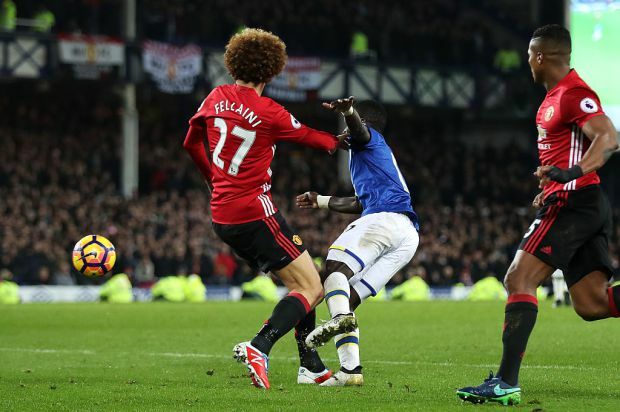 Fellaini’s absolutely foolish challenge on Idrissa Gueye in the box, in which he arrived late then stuck his left leg out, inviting the Senegalese to nominate himself for an Oscar for best simulation, cost his club a much-needed victory. United went from being three behind Tottenham at the rear of the leading Premier League six-pack to fronting the peloton a point ahead of West Brom and six behind Spurs. Further, United have now drawn five Premier League matches on the trot. However the boss might spin it, the trend is not an aberration. Mourinho’s squad do not know how to win. Their boss’ attitude is cynical and pessimistic, believing fate has conspired against his side. He shrugs it off as a storm the club must weather rather than tame. The old adage saying a side adopts its manager’s persona applies to United. Rather than fighting against the world, José’s players are resigned to their fate. I’m unsure never letting Marouane Fellaini take the pitch in a United shirt again is enough to remedy matters. Nor am I certain gluing the manager to his seat during matches is sufficient, either. An attitude adjustment is required. If Mourinho can’t provide it, any good he is doing will be undermined.